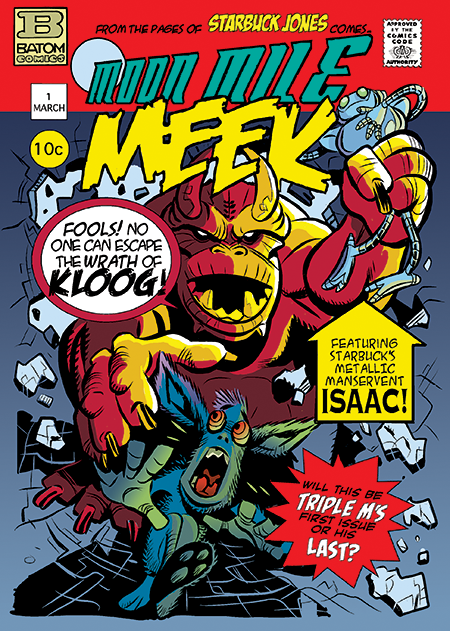 When I asked Rick Burchett to create the Moon Mile Meek (don’t ask me what that means, I was in the fifth grade when I came up with it for Jimminy’s sake) Batom Comics cover, he said that he had been reading the Tales to Astonish compendiums from Marvel and asked if he could create a cover in that style. I said sure and result was this rollicking cover depicting MMM beatin’ feet from the Kantankerous Kloog. When it came time to color it, I went to the same source for my inspiration. The result is a cover that I think would do Stan and Jack, or Steve or Don proud. I’m reluctantly passing on the chance to hang this beauty in my house, and giving you the chance to display it in yours. To see how to make that happen, just go to the gallery page on this site and check it out along with all of the other cool covers already revealed there. You’ll be helping yourself as well as the people who will be benefiting from the Lisa’s Legacy Cancer Fund. A pretty sweet twofer if there ever was one.